If you are playing several notes at the same time, then you are playing piano chords. Simply put, when multiple notes are played together, piano chords are achieved. The chords then come together to form a melody. Every song that you hear has a melody and it is through each melody that music is achieved. Sound complicated? Well, that's ok because it really isn't as difficult as it sounds. As a musician, whether it be professional or hobbyist, you will need to learn the various types of piano chords. The more that you understand about piano chords, the more variety you will have when playing. If you want to write your own music, you not only need an ear for tunes, but also the understanding of how to make them come together. A good instructor will introduce you to piano chords during lessons. 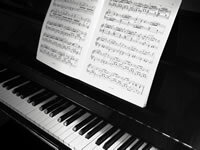 If you already have some experience, but simply want a better understanding of advanced piano chords, discuss these options with a private tutor or music teacher. By gaining an understanding of what sounds good and what doesn't, you will have the undeniable edge over other budding musicians. Every piano has 88 keys and while it may seem intimidating to learn piano chords, it actually comes down to memory. When typing on the computer, you know which keys to press in order to make a lowercase letters change to uppercase, right? By studying piano chords, you will begin to understand which keys to press at the same time in order to play a chord. During your introduction to learning piano, an instructor will cover some of the basic chords and you will come to know their sound when you hear them. After enough practice, you will be able to immediately identify piano chords by ear. There are several other ways to help in your learning of piano chords, including instructional books, tutorials and videos. In the beginning, it may even help to label the keys until you have a better understanding of each of their unique sounds. As you progress in your learning, you can remove the identification labels and play using any arrangement of sheet music. Learning to identify notes will play a large part in your understanding of piano chords. As you move through your studies, you will learn all of the terminology associated with piano playing and the definition of each. Learning piano chords is a very important part of the process, but it does require a certain degree of patience. Always remember that time will lessen the difficulty and, before you know it, you will be playing and identifying piano chords by ear. While it may seem intimidating at first, you will soon begin to notice the ease of playing piano chords will come naturally. 1) It's easy. Learn 3 chords and start in. 2) Even though it's easy to get started, you don't have to stop there. You can learn more and more chords and more rhythm patterns and get really good. 3) You'll be able to play "Happy Birthday" while the gang sings it. 4) You'll be able to play half-a-dozen Christmas carols. In case you haven't noticed, Christmas comes every year, so every year you'll get better as you participate in family gatherings. 5) You can help your kids learn to play the piano, guitar, or most any other instrument by learning chords. Most teachers don't teach chords, so you'll be giving your kids an advantage by learning chords. 6) People will admire you. It's true. Musicians are popular. Anyone who can play anything is in demand at parties and social gatherings. And if you can "chord" while others sing, you're bound to be popular. 7) Piano playing using chords is good for your brain. Studies have shown that people who actively participate in music do their brain lots of good. And since chords require 3 or 4 notes at a time instead of one, you are giving your brain a good workout. 9) Piano playing is excellent therapy for the stress of life. Many professional people come home from a hard days work and relax by expressing their emotions on the keyboard. Play a few dark and angry chords, and you'll be surprised how much better you feel! 10) Piano playing is a blast. It's just plain old fun. So learn 3 or 4 chords and get going. Maybe you'll stop there and enjoy it the rest of your life. But just maybe you'll love it so much that you keep going and turn yourself into an excellent piano player who can read music as well as play chords! This article is brought to you by Ian Williamson from Play Guitar Submitted with Article Distributor . Duane Shinn is the author of over 500 music courses for adults, including "How To Make Money Teaching Music To Beginners" at www.home-business-music.com He is also the author of the popular free 101-week online e-mail newsletter titled "Amazing Secrets Of Exciting Piano Chords & Sizzling Chord Progressions" with over 60,100 current subscribers available from www.playpiano.com . The views and information held within this site are intended only as a guide. Expert advice should be obtained before embarking on any instrument purchase or training. Music Info4all are not responsible for information held on any pages external to this website.